With all the snow flying in Massachusetts these past few weeks, I nearly forgot that now is the time of the “orange wars.” At the beginning of every year, I must also mind the lunar calendar as well as the Western or Gregorian one, as Chinese, Koreans, Vietnamese, and other cultures continue to follow the cycles of moon phases to track the seasons and their related cultural and religious activities. February 19 was Lunar New Year’s Day for 2015, which—according to the Chinese zodiac cycle—is the Year of the Ram or Sheep. A nicely done tale of how the Zodiac animals came to be chosen can be found here. For Chinese, the new moon of the first lunar month is celebrated as an opportunity for fresh starts. The waning weeks of the twelfth lunar month, in January or February, are punctuated by intense house cleanings and the obtaining of new clothes for the coming celebrations. Red paper banners with auspicious couplets convey luck and prosperity to all who enter the house. 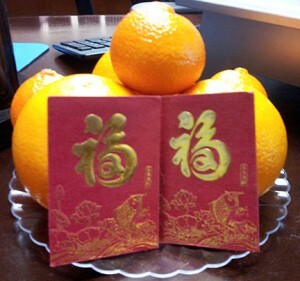 Families visit each other during the first fifteen days of the new year, bringing gifts of oranges and tangerines, symbols of wealth and luck, and feast sumptuously together at home or in restaurants. Red envelopes containing “lucky” money are given to the household’s children and unmarried adults by family elders. As a young child I witnessed many friendly arguments on my home’s doorstep as my parents attempted to press a package of oranges (with a concealed red envelope!) on our departing guests, who in turn tried to leave graciously without it. Not fully understanding this traditional exchange of luck and wealth, I had disliked the loud, boisterous fruit trading enough to call it the “orange wars”—though now I remember it fondly. When Chinese first started arriving in the United States, their system of dating would have perplexed officials asking them for information. I am sure that some arriving Chinese were assigned new birth dates before a conversion system came into use. Not only was the lunar calendar used to set the month and day of birth, but the year was expressed as the reign year of a particular emperor. Many Chinese coming before 1900 were born some time during the reigns of four Qing emperors, so that an immigrant with a Chinese birth date of “last year of Tongzhi, 6th month, 9th day” would have been recorded in the United States as being born in China on July 11, 1875. Asia-Home.com’s lunar to Gregorian calendar converter is the only one I have found that can convert nineteenth-century dates, though you must play around with the date selections to get the proper Gregorian or lunar date match. The Hong Kong Observatory has a helpful grid presentation of lunar to Gregorian dates after 1900. More snow may be in the forecast, but the Lunar New Year is upon us, and my aggravation is halved: the earlier snow fell in the old year. The coming year will be a good one. And, for about a week more, I have my supply of oranges ready for battle. Xin nian kuai le! Alice – very interesting. Thank you. I looked at the Hong Kong site and went to 1968 for the date of the new year. I was in Saigon in the U.S. Army at the time of the Tet Offensive. Thanks! That was really nice to read. One Alice to Another! A friend, now in her 90s, had a Chinese grandfather, one of the very first Chinese scholars sent by the last Empress to study in the US. They were to attend US high schools, then go to Harvard and other top US colleges, and return to serve her and her court. According to what I remember of my friend’s story, the Empress recalled the young scholars because they “went Western” and many didn’t want to return to China. Her grandfather was taken under the wing of a Chinese diplomat, and “hidden in plain sight.” He met her grandmother when they were in high school. She was 16, and they wanted to marry. Her parents gave permission, but said they’d have to wait 10 years. They waited, during which time he got a PhD from Harvard. My friend has some of her grandmother’s writings for those 10 years, but nothing survives for afterward, unfortunately. She knows little else about either, and nothing of her Chinese ancestry. Thank you for reading my post, and for your friend’s family story. The Chinese Educational Mission was an ambitious and forward-thinking project to help China step into modern times that, unfortunately, was cut short by Imperial xenophobia. The 2011 book, “Fortunate Sons: The 120 Chinese Boys Who Came to America, Went to School, and Revolutionized an Ancient Civilization,” by Liel Leibovitz and Matthew I. Miller documents the experiences of the original group of young men and boys of that mission. The website “Chinese Educational Mission Connections” at http://www.cemconnections.org/ describes the history of the mission and has biographical information on the 120 students, many comprehensive and sourced.